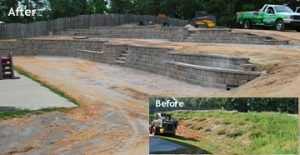 Retaining walls offer cosmetic & artistic improvements as well as solutions to drainage and erosion or steep grade problems. 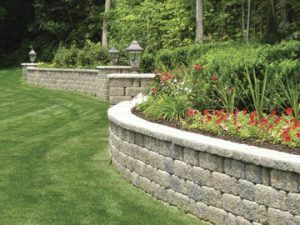 Block retaining walls will last a lifetime because they are concrete. Segmental block retaining walls, pre-engineered retaining wall blocks, and modular retaining wall systems are all the same product. They are colored and pre-engineered building blocks of various sizes, shapes, colors and textures. Specific building practices must be followed to ensure a safe wall that will last a life time. The most popular walls are the 6” & 8” blocks from pavestone. The “Highland and “Diamond Pro” series are a “broken face” design available in a 1 or 3 piece (width) block. The 3 piece design helps break the “brick pattern” of same size blocks in the new retaining wall by adding a random looking vertical joint pattern. This type of wall is the most versatile and cost effective wall available. Long serpentine curves, short & tight curves, outside & inside corners, and various columns and steps can be created with optional blocks and caps. Because manufacturers offer numerous combinations of size and color, these walls can be tailored to meet every jobs unique aesthetic requirements. You can choose from solid colors, 2 color or 3 color blends to help match existing architecture or other hardscape items already in your landscape. 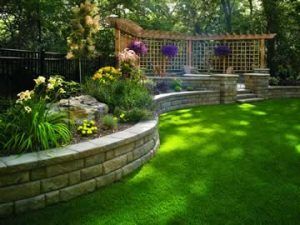 There are also retaining wall systems that offer a finished face on two sides for corners, columns or free standing, patio / seat walls. Matching or contrasting cap blocks offer another design option and mixing the color of blocks within the wall can add more unique design elements. Custom color blends are available direct from pavestone for large projects. 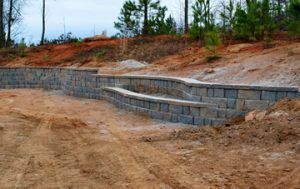 We are certified wall builders with decades of experience building many types of retaining walls and using several different wall systems and materials. We have seen and repaired numerous failed walls. Because we know why some walls fail, we know what to avoid. Proper experience-based installation and following manufacturers recommendations allows us to offer 2 yr. workmanship warranties on all our walls and many other hardscape items. Properly designed and installed walls will not fail! We can proudly state that we have had zero call backs or warranty work issues. Visit our how to build walls page for information on the proper construction techniques. We build walls in wide range of sizes and designs to meet every customer’s needs & budget. Please visit our gallery area for more examples of our work then call us today to get started.